The 1st Pla-Wrestling Robot Fight sponsored by Ishikawa-san, took place at Sunpian Kawasaki in Kawasaki City, Kanagawa Pref. on Aug 19, 2017. 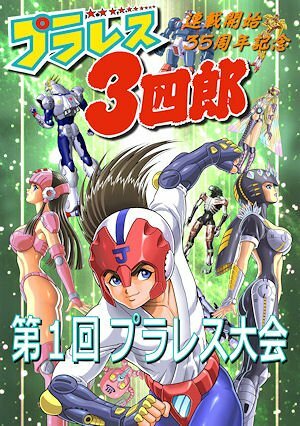 The 1st Pla-Wrestling Robot Fight was named after a Japanese famous animation `Pla-Wres Sanshiro' published as a comic just 35 years ago in 1980s. The book, 14 volumes have been published by Akita Publishing Co., Ltd. on the market. The author, Jiro Ushi and Animator, Minoru Kamiya also attended the competition. It is the work which junior high school student, Sanshiro Sugata, makes plastic wrestler robot incorporating micro-computer, named Juoumaru. He joined the Pla-Wrestling competition with his robot and fights against a lot of Pla-Wrestler robots. The major regulation of the 1st Pla-Wrestling Robot Fight was as follows, just Pla-Wrestler robot on the comic or original character robot made for Pla-Wrestling fight could attend the competition. Robot gets the game by fall with three counts or knockdown with ten counts. Details of the regulation were described here. Fifteen Pla-Wres Robot joined the 1st Pla-Wres Fight. The 1st Pla-Wres Champion was Bionickser by Igaa. The 2nd place was Diener by Poka-tan. Sanzai-san reported the details with pictures as (1) , (2) in his blog (in Japasense). Nacky also reported all joined robot's pictures in his blog. The 1st Pla-Westling Robot Fight videos of all competitions were also uploaded by Robot Event Haishinya in their YouTube Channel.